Shree Jagannath temple, one of the most impressing monuments of the Indian State Odisha, was constructed by a famous king of Ganga Dynasty Ananta Varman Chodaganga Deva dating back to 12th century at the seashore Puri. This astounding Vaishnava temple enshrines Lord Jagannath, Devi Subhadra and Balabhadra. The main temple of Jagannath is an impressing and amazing structure constructed in Kalinga architecture, with a height of 65 meters placed on an elevated platform. The Temple and the Icon :- The Temple of Jagannath build on an elevated ground about twenty feet above the level of the surrounding area, presents an imposing sight and can be seen from miles away. The height of the main temple or Vimana above the road level is 214.8”. It is a fine specimen of the “Pancharath style of Odissian temple architecture. The construction of the present edifice is credited to Anantavarman Chodaganga Dev (1078 – 1147 A.D.) of the illustrious Ganga dynasty. The main shrine consists of four distinct buidings viz. the Vimana or the Great Temple, Jagamohan or the Hall of Audience, Natamandapa or the Dancing Hall and Bhogamandapa or the Refractory. The Natamandapa is approachable by two entrances on the North and South. The main door from Natamandapa to Jagamohan is called Jaya BijayaDwar and there is another door to Jagamohan on the South side. The only entrance door to Bimana is known as Kalahata Dwara, which is considered very sacred. The images of Jagannath, Balabhadra, Subhadra and the emblem Sudarshana are installed in the inner sanctuary of the temple on a raised platform called the “Ratnavedi”. The miniature images of Laxmi, Saraswati and Madhab are also placed on the Ratnavedi along with the main deities and worshipped. The platform made of stone is 16 ft long, 13 ft wide and 4 ft high. There is a circumambulating path around the platform. The temple has four gates at the Eastern, Southern, Western and Northern mid-points of the outer wall, known as “SIMHADWARA(Lion’s Gate), ASHWA DWARA (Horse’s Gate), VYAGRHARA DWARA (Tiger’s Gate) and HASTI DWARA (Elephant’s Gate. They are said to represent Dharma, Jnana, Vairagya and Aishwarya. In front of the Simhadwara is installed the ARUN STAMBA made of a single solid chlorite stone and upon it beautiful Arunsquart in obeisance. East – East of the Simhadwara are situated Dolamandap Sahi, Matimandap Sahi, Balukamandap and the Sea. Also situated there are Radhavallabh Matha. Mango Math, Emar Math, Neula Das Math, the hermitage of Maharshi Angira, the shrines of Narayani, Chakra Narayana, Nrusingha and Bedi Hanuman. WEST – On the West or the Western Gate are situated Baseli Sahi, on the South – West of the shrine of Harachandi and at a further distance the famous shrine of Sri Lokanath. SOUTH _ Balisahi, Shyama Kali, Dakshina Kali, Shmashan Chandi and Astha Sambhu temples. NORTH - Markeandeswar Sahi, Markadeswar Tank, Sapta Matruka, Uttarparswa Matha, Bada Odiya Math of Atibadi Jagannath Das, Trimali Math and Ramji Math etc. The Holy Trinityh is guarded by eight Siva shrines i.e. Markandeswara, KapalamochanaLokanath, Yameswar, Nilakantheswara or Yajneswara, Bilweswara, Isaneswara and Pataleswara stationed in eight directions. Similarly eight mother goddesses i.e. Batamangala, Alamchandi, Ardhashani, Merchika, Narayaini, Shyama Kali, Dakshina Kali and Ramachandi also guard the Holy Trinity. The Temple of Narasingha : - It is an eleventh century (Somavansi period) Rekha temple to the West of the Mukti Mandap and South – West of Jagannath Temple on the Pancharatha plan. The temple contains 61 inscriptions, the earliest being of 1113 A.D. in the decorative programme, the temple displays the ten Avatara of Vishnu, seated Dikpalas, Vidalas, Vertical creeper ands, etc. 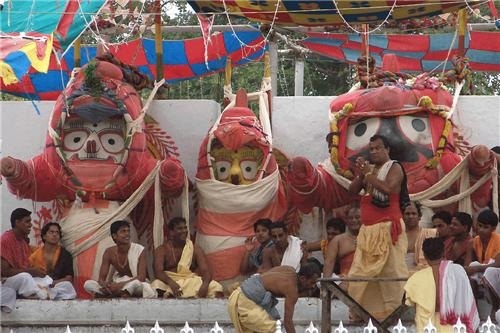 Long before the present Jagannath Temple was constructed and Purusottam Jagannath was believed to be worshipped here. The Temple of Vimala : Goddess Vimala is the presiding of Purusottam Kshetra. She is Bhairavi. The Temple is situated at the South –West corner. In the decorative programme, it has eight-sete3d Dikpalas and their consorts. Mahisamardini, Narasimha, Vishnu-Buddha and royal persons etc, appear in the central niche. On the West there is a beautiful image of Chamunda as Parswadevata Four-armed Vimala is flanked by two female attendants. She holds Akshyamala Nagapasa, Kalasa and displays Varada pose. When the food offered to Jagannatha and is reoffered to Vimala it becomes Mahaprasada. The Temple of Lakshmi :- The temple complex of Lakshmi is situated in the North-West corner with a store and a kitchen nearby. The Jagamohan is provided with balustrade windows. The ‘bedha’ of the temple contains pilasters, scroll work, seated Dikpalas and female figures. The Parswa devataas are mainly the images of Gajalakshmi, Lakshmi is four armed. She holds lotus in two hands and displays Varada Pose. Two elephants are seen pouring water over her head. She assumes a special Vesha on each Thursday. She is verily Rukmini and Jagannath is Krushna. The temple of Surya :- A beautiful image of Surya (probably brought from the Konark Temple) is worshipped here. It is a pillared open hall with 16 pillars, an important seat of learning. The present mandap was rebuilt in 1578 A.D. Sanyasis of Shankaracharya Math of Puri and specially ordained learned Brahmin Pandits of adjacent 16 villages (Shasanas) are qualified to take their seat here and present their learned discourses. Kalpa Bata. The ancient most tree (Primordial tree) is said to have been grown in the navel region of the Shankha Khetra. In the writings of Oriya poets, the tree bears many other synonyms, i.e. Devanashana, Akshayabanchha or Vamshi Bata. The old Kunda is no more in existence. Instead, a small tub has been provided and in it one finds a carved stone image of Bhusandi Kaka (Crow) lying flat in the floor of the tank. According to legend, a crow named ‘Bhusanda’ fell into this tank which contained ‘Karara’ water and was suddenly metamorphosed to a four-armed devotee of Narayana. In the other section of the Kunda, there is Nabhi Chakra in the shape of Nilachakra. There are 22 stairs which run from the Simhadwara up to the door way of the inner wall. During the Car Festival, the three idols are ushered into Pahandi procession amidst a huge congregation of devotees. During the Mahalaya (Amavasya) people here offer oblations and lamps to the departed souls of their ancestors. The old kitchen was situated at the rear south of Satyanarayan Temple. On account of shortage of space, the present kitchen was built during the reign of Divyasinghadeva (1682-1713 A.D.). The roofed kitchen lane leading to the ‘Natamandira’ was constructed between 1720-1725 A.D. There is a subsidiary kitchen, Merda Rosa behind the Satyanarayan Temple. Special Kitchens of Lakshmi and Surya also exist. 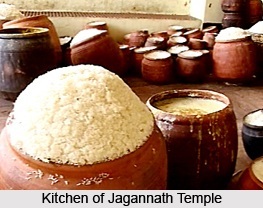 Fifty-six (Eighty –six on the MakaraSankaranti) varieties of food/delicacies are prepared here daily which can feed as many as 25,000 people and it has the capacity to cook for one lakh at a time. The holy food is cooked in earthen vessels and the fuel used is wood only. Nearly 600 Suaras (Temple cooks) and 400 associates are engaged daily for cooking. A unique place in the north-east where sacred foods (Mahaprasad) offered to the deities are sold to all and sundry. The Snanabedi (75 feet X 75 feet) is located on the north-east of Ananda Bazar towards the outer wall. In the middle, on a raised Simhasana, the three deities take the annual ritual bath on the SNANA PURNIMA day, roughly a fortnight preceding the famous Ratha Yatra. The platform is so high that people can witness the festival standing on the Grand Road outside. The proxies of the Trinity are placed in a temple towards south of Jagamohan to be brought out for ceremonial outing on festive occasions. Sri Madan Mohan, Sri Rama Krishna – They are ceremonially taken to the Narendra Pond every day during the ChandanYatra for a cruise. Sri Nrusingha– He is taken to JagannathBallabha Math for special worship on the NrusinghaChaturdasi day. Sri DolaGovinda- Sports on the spring swing during the DolaYatra. Sri Rama Lakshman – They are taken to JagannathBallabha Math for special worship on the Ramanavami. Sri Narayan - He is taken to the sea-shore on every Amavasya for a special ritual linked with the Mahodadhi. Sri Hanuman - He is taken to Chakratirtha-via-JagannathBallabha Math on ChaitraSankranti for a Special Puja. It is said to be the most ancient place in Niladri. It is said that Nilamadhab was worshipped here by Viswabasu. The word Koili may be Kaivalya. In South India, Koili or Kovil stands for the temple. According to a legend here Krishna one appeared before Radha in the shape of a Koili (Koel) or cuckoo. It is known as the burial ground for the Trinity. During the Navakalebar the old images are buried here and the new images re also carved here. (i)	Suna Vesha – The 11th day of the bright fortnight of Asadha. (iii)	Kaliya Dalana Vesha – B The 11th day of the dark fornight of Bhadraba. (iv)	Pralambasura Baddha Vesha –The 12th day of the dark fortnight of Bhadraba. (v)	Krushna Balaram Vesha- The 13th day of the dark fornight of Bhadraba. (vi)	Bali Vamana Vesha – The 12th day of the bright fortnight of Bhadraba. (vii)	Raja Vesha – The 10th day of the bright fornight of Aswina, the full moon of Pausa and the full moon of Phalguna. (viii)	Radha Damodar Vesha – The 10th day of the bright fortningh to Aswina, the full moon of Pausa and the full moon of Phalguna. (ix)	Thia Khia Vesha- The 11th day of the bright fornight of Kartika. (x)	Bankachuda Vesha – The 12th day of the bright fortnight of Kartika. (xi)	Nagarjuna Vesha – During Panchuka in the month of Kartika. (xii)	Adakia Vesha – The 13th day of the bright fortnight of Kartika. (xiii)	Dalkia Vesha – The 14th day of the bright fornight of Kartika. (xiv)	Raja Rajeswari Vesha – The full moon of Kartika. (xv)	Padma Vesha – The 2nd day of the bright fortnight of Magha. (xvi)	SradhaVesha – From the 1st to 3rd day of the dark fortnight of Magha. (xvii)	Gaja Uddharana Vesha – The full moon of Magha. (xviii)	Chacheri Vesha – From the 9th day of the bright fornight to the full moon of Phalguna. (xix)	Chandana Lagi Vesha – From the 19th day of dark fortnight to the full moon of Jyestha.